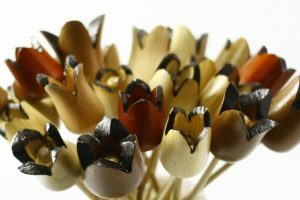 Everlasting Wooden Flowers – for your Special Someone! Show your appreciation to your special someone by giving them beautiful, everlasting wooden flowers! These handcrafted flowers never wilt, and as the years go by, their color changes ever so slightly, becoming deeper and richer. They’re the perfect gift for Valentines Day or any special occasion. I leave the wood in its natural color, because Mother Nature herself makes bright orange, vibrant yellow, chocolate brown, speckled black and every color in between. 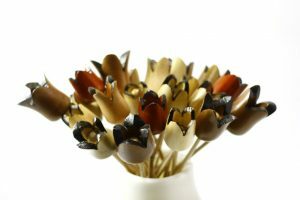 The flowers are made from a variety native or cultivated woods from Israel and around the world. Among the woods I use are: Israeli rosewood, tamarisk, lemon, almond , olive, and many more. 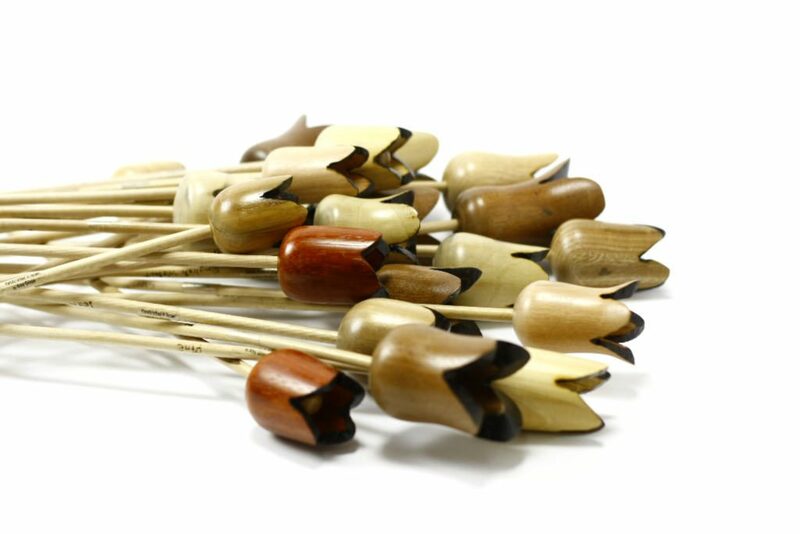 I turn each flower on the lathe, taking clues from the natural grain pattern on each individual piece to create a tulip like flower. Some are open, some are closed. I leave in the so called “flaws” of the wood to remember that those inconsistencies and old growth are part of the fabric of life. They only enhance the flower and make it more interesting. After the shape has revealed itself, each flower undergoes intense sanding until it is silky smooth. Only then, the true beauty of the wood emerges. Then the flower goes for further enhancement. I use fire burning to contrast the natural wood color of the flower, bringing out the beauty of the wood. Then I attach a uniquely styled wooden stem and etch the name of the wood on the stem. The flower is not yet complete. To preserve the wooden flower, I apply at least 3 layers of finish, sanding between each layer, for a vibrant glossy sheen. Should you want, you can add scent by spreading a drop of your favorite essential oil essence inside the flower. The wooden flowers are sold in sets of 6 and come gift wrapped. Where possible I will select flowers from 6 different wood types, some open in full bloom and some closed buds. Get yours here and give the gift of everlasting love.